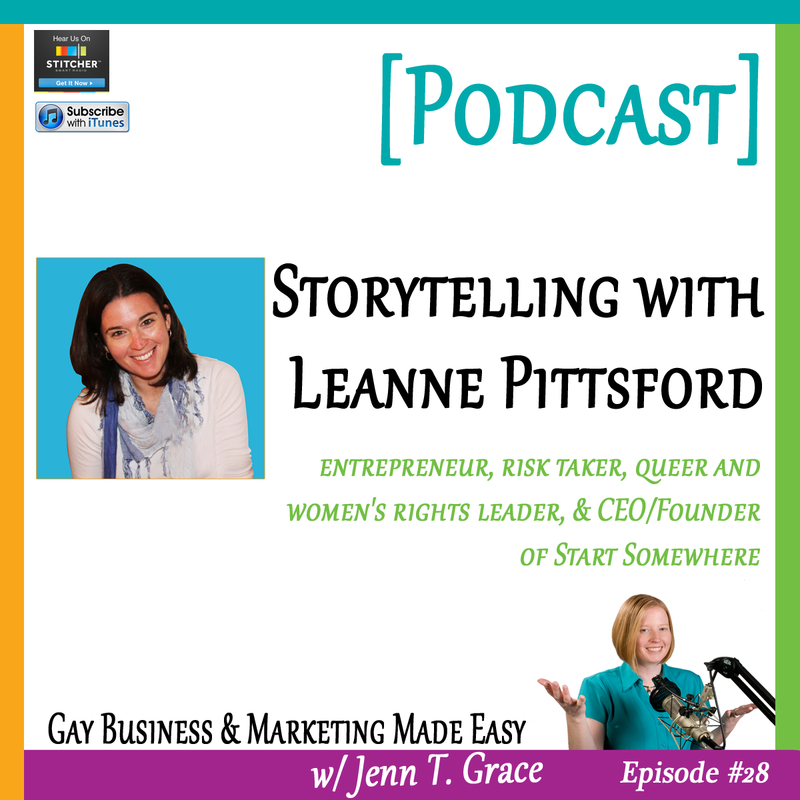 So we are talking to Leanne Pittsford today who is a woman of many titles – she is an entrepreneur, risk taker and a queer and women’s rights leader. She is also the CEO & founder of Start Somewhere, which helps organizations with their online presences from design support, to database and CRM support to tech and communications support. Listen to the episode by clicking the play button below! Thanks for being on the show, Leanne. So Leanne and I met through a mutual friend, Jennifer Brown, because of her upcoming Summit called “Lesbians Who Tech” (and the people who love them). We are going to get into more about the Summit later in the interview but I first want Leanne to share more of her story. Leanne, why don’t you take a few minutes and tell us a little bit more about you and your story, and what your path looked like that lead you to where you are today as a lesbian in tech? So before we get into some of the more serious questions, share with us one fun fact about you that few people know or would expect? What was your “aha” moment when you realized this is what you should be doing in life? What inspires you and keeps you motivated to do what you do each and every day? What is the best piece of advice you were ever given? For listeners looking to market themselves to the LGBT community, what advice would you give them to be successful? How have you been able to leverage your status as an LGBT person? What is one book, program or tool that has transformed or streamlined the way you go about business? Now that we are at the end of the interview I always ask what is one thing with your business that is just really exciting for you right now – so I would love for you to tell us about the Lesbians Who Tech Summit. Could you explain what the Summit is, where it is and how people can get involved. Thank you so much for taking time out of your busy day to talk with us. Why don’t you give yourself a plug and let everyone know where they can find you? Join the next webinar! RSVP HERE! Check out my new column on Chicago Spectrum! Would you prefer to read the transcript than listen to the episode? No problem! Read the transcript below. You are listening to the Gay Business and Marketing Made Easy Podcast, Episode 28. Welcome to the Gay Business and Marketing Made Easy Podcast where you’ll learn how to do business with and market to the LGBT community in an authentic and transparent way. We’re talking about the $790 billion lesbian, gay, bi-sexual and transgender community. We’ll help you grow your business, gain market share and impact your bottom line. And now your host – she’s an entrepreneur, a marketing maven and an advocate for the LGBT business community. Jenn, with two N’s, T. Grace. Well hello, hello, hello. It is February 6th of 2014, and I don’t know about you, but I’m a little bit tired of the snow. Here in Connecticut we just got about six inches last night, and we’re expecting another six to ten tomorrow, and then there’s a whole other storm headed its way this weekend. So I’m sure in your area you are getting hit with a significant amount of snow as well, because it seems to be kind of blanketing the entire country. So it’s a really interesting winter, although this morning’s snowfall looked very pretty and I’m looking at it right now, it’s just- it’s very, very much like a painting. However, the logistics of it are not that great because my kids had a snow delay by an hour and a half again this morning. So for those of you who are listening who have daily interactions with me, you are well aware of my wanting to pull my hair out because of the amount of times that school has been cancelled, the kids have been let out early, the kids are going in late. There’s just a whole host of different scheduling issues that have been going on this winter. So I am certainly looking forward to the spring, regardless of what the groundhog has to say. And speaking of spring, I know I’m personally in a ‘I cannot wait for spring to be here so I can get back outside and start exercising more formally like I used to be,’ and I actually just went back to the gym today, I had about a two month hiatus which I certainly can feel it. I feel like my body can feel not having been in a while, I feel like my mind can tell I haven’t been in a while, so I am super excited that I went back to the gym this morning, and I actually just got back- just, just got back about five minutes ago and I realized that I did not record the intro to this podcast today. So here I am, and I just want to give you a couple of announcements before I start the interview that we have with Leanne Pittsford. And this is- you know if you’re a long-time listener of the podcast, you know that I always kind of rattle off a couple of things that are going on prior to the interview. And a couple of things that I just want to make mention of is the fact that our delightful US media is the gift that keeps on giving these days. And when I say that, what I’m really saying is in episode 27 we did a really deep dive on Duck Dynasty and all of the fiasco that ensued with Duck Dynasty and Cracker Barrel and A&E and a whole host of other things that were happening. And since that episode, we have additional things that have come out in the media, such as the Macklemore and Ryan Lewis Grammy performance. We had Coke just come out with a gay couple featured in one of their Superbowl ads, and I just want to encourage you to head over to the website to check out all of those things, because indeed I have written about them and I do plan on making them part of my webinar- the next webinar that I have coming up which is on February 19th. And that’s at 1:00 PM Eastern Time, and you can head over to the website at www.JennTGrace.com/webinars, and you can RSVP to attend, it’s free, it’s about an hour long. I leave additional time after that hour for questions and answers so if you have any questions that might be on your mind that you’re looking for some advice around, please feel free to attend the February 19th webinar. And as I say every time I mention the webinar, if you are listening to this podcast and it is well past February, perhaps it’s even December and you’re listening to this; do not worry about it at all, because you can still head over to the same website address, and you can sign up for the next webinar because I do them on a monthly basis, because the advances that are taking place in LGBT marketing and business and communications are just so plentiful lately that I always have something new to talk about, and I don’t really foresee that changing any time soon. So please, please, please just head over to the website, I look forward to seeing you on the next webinar. Additionally I have a couple of other smaller things that I would like to announce. One of them being that I would love for you to join the mailing list as well. I’ve just recently renamed it, it really- it actually didn’t even really have a name to it before, but it’s now called ‘The Gay Marketing Insider.’ And really what it is, is that you will have some sort of email delivering some sort of quality content about once a month, and I really try to only email once a month because I don’t want to clutter up your inbox any more than it may already be. But you may get some additional inside tips that I’ve just recently uncovered in terms of effectively marketing to the community, I may pointing you to some new resources that I’ve uncovered. Just really kind of insider access to a lot of what I’m doing and researching on. So if you want to do that, you can head over to www.JennTGrace.com/podcastlist and if you can’t remember that URL you can just hop over to the website and there’s a button right on the right that says ‘Join the Gay Marketing Insider’ and you can just click there and voila! Easy as that. So something that I’m really excited for having put together on the website is a new Hire Jenn page. I had somebody just recently- they were going to the website and they were trying to figure out how to hire me for something, and they basically said that it just wasn’t clear enough. So I’ve revamped that page significantly, and you’ll see that there’s four primary offerings. 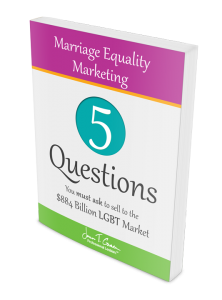 So the first one being a marketing critique or review, whatever you would like to call it, of any type of LGBT marketing materials that you might be using in your business. I am more than happy to review them, and there’s information on the website about how that- what that looks like, what the process is, et cetera. Because a lot of times you don’t necessarily need to hire me for an entire project, but really you just want my eyes on something that you’ve already done to find out if you’re in the right direction or not. So that’s one of the services. The other service which I have had an influx of people signing up for which is totally awesome, is the monthly marketing accountability coaching. And I know it’s a long name, but I wanted to make sure I got all the right words in there. But essentially it’s where I meet with you on a monthly basis, just to make sure that you are making steady progress towards your goals as being one of the businesses that are really in it for the right reasons, and are really truly marketing to the LGBT community in that authentic way that I talk about a lot. So I have had three new clients just in January join this program, so it’s pretty awesome, and it’s fun for me because I get to learn more about other people’s businesses, and not only am I coaching around marketing, specifically the LGBT marketing, but a lot of times I’m noticing that I end up uncovering other business-related issues and I’m able to kind of help my clients work through that. So if that’s something interesting to you, please feel free to head over to the website and just reach out to me and we can talk about how we might be able to work together. And then we have the Gay Marketing Peer Advisory Board; and this is something brand new that I have not announced, I’ve just kind of put it on the website, but I have not talked to anybody about it, I have not formally sent out any press about it. But essentially it’s a mastermind group. And I don’t know if you are familiar with mastermind groups or not, but if you are a listener of this show and you’ve been listening for a while, I’m sure you’ve heard me talk about them before because I really firmly swear by them because there’s just something beautiful about being able to bounce ideas off of a peer who has your best interest at heart. And I belong to three different groups right now, and they have three different functions, and they’re all amazing and I absolutely love the advice and the comradery that I get from my fellow peers. So I have decided to just recently in the end of January actually, so really just in the matter of a week or two ago, decided to really kind of push this forward because I see the value and the benefit of others who are trying to market to the community, to be able to come together and have conversations to figure out what you’re doing ineffectively, what you’re doing effectively, and how you can essentially learn from one another. So that is something I’m really excited about. So if that’s something interesting to you, please feel free to head over to the website, there’s a big blue button for it, just click on it and follow the instructions and reach out to me, and we can talk about what type of group we can put you in and what type of other business owners are effective for you to learn from and all that fun stuff. And then finally the fourth service that is now listed on the site, and mind you three out of the four- the peer advisory board is the only one that I haven’t been doing before. But the other three I have been doing, I just wasn’t really showing it well on the website. But the fourth one is in person and virtual workshops and training. So this is something that I do a lot of. I do a lot of webinar trainings, I actually go into businesses and I train live in person, and these are really fun for me to do, and essentially if you come to me and you want to market to the LGBT community, and you have some sort of front end staff, so you’re a hotel for example. And if you want to market to the LGBT community, you need to make sure that your staff is fully trained and they’re not going to actually do more damage than good for your brand when you’re out there specifically trying to reach the community. So I do a lot of trainings like that where I just go into different business environments that have a lot of front end people, train them on how to communicate effectively, and that in turn helps the overarching LGBT marketing plan move forward in a really successful way. So that is that in terms of my many random announcements, or seemingly random announcements. And one other just quick thing is that I have started a new column on the Chicago Spectrum, which is an LGBT publication which I’m super excited about. I’ve been doing it for a couple of weeks now, so I encourage you to check them out. And it’s www.ChicagoSpectrum.com. And if you are on Twitter, they are also on Twitter there and I’m really active on Twitter these days. I find that for me personally Twitter is far more- a far more conversational outlet than Facebook is becoming. Facebook to me kind of seems a little bit stale these days. So if you want to have a conversation with me, which I would love to have a conversation with you, please go over to Twitter and just tweet at me, send me a direct message, let’s have a conversation because I really love hearing what’s happening out there for businesses who are trying to market to the community. I want to know those hurdles and the roadblocks that you might be coming up against, because at the end of the day I’m here to try to help you. So the more that you tell me what you need, the easier it is for me to do that. So there you have it, that is- that’s my lengthy list of announcements, far more than usual, I’m not normally this verbose in terms of my announcements, but I have a lot to tell you which is I guess a good thing. And it’s February, waiting for spring to come around. I know that the guest that we have today on the show, Leanne Pittsford, she is in the San Francisco Bay area, so I now that she is not suffering in this treacherous winter like many of us are in the rest of the country. So I encourage you to sit back and relax, and have a listen to this really awesome interview with Leanne, and make sure that you send her a tweet or me a tweet after you listen and just let us know what you think. Thank so much and enjoy the interview. 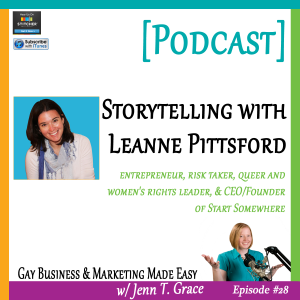 So we are talking to Leanne Pittsford today, who is a woman of many titles. She is an entrepreneur, a risk-taker, and a queer and women’s rights leader. She is also the CEO and founder of Start Somewhere, which helps organizations with their online presences from design database and CRM support to tech and communications support. So this is just a really high level of who Leanne is, but we’re going to dig a lot deeper into her story today. So thank you for being on the show, Leanne. Of course, I’m super excited. I’m totally happy you’re here, and I just want to let the listeners know that you and I actually met through a mutual friend of ours who is Jennifer Brown, and she reached out to me because she was telling me all about your upcoming summit which is called, ‘Lesbians Who Tech (and the People Who Love Them).’ I always love seeing that in parentheses next to it. So we’re going to get into a little bit more about the summit later in this interview, but I first want to just kind of start from the beginning with you if you don’t mind, and just take a couple of minutes to tell us a little bit more about you, and your story, and kind of what your path looked like that got you to where you were to where you are now as a lesbian in tech. Totally, it’s a little bit of a winding road as most things are. So I started out as a poli-sci major in college, I was a big political geek, I thought I would go to law school and become president some day. That was sort of my thing, and then you know slowly you start to learn about different things like sexism and how the world works, and you know all of a sudden in college I was like, “I don’t want to go work for the man, I don’t want to go to law school, I don’t want to have a lot of debt.” And then I didn’t really know what I wanted to do, and so I ended up at a Master’s program focused on sort of the ‘isms, you know? Sexism, racism, classism, you know more in like a social good umbrella. You know maybe nonprofit management at San Francisco State in San Francisco. And so one of the things I learned there which was really interesting for me, is that you know they teach you that you should focus on a community first that you’re a part of, right? And so as a white gay woman, I noticed a lot of the other gay people did not want to focus on LGBT issues. And so that’s when I sort of had this moment of, “Okay, well I’m white, I’m a woman, I’m gay, I should focus on something that directly relates to my experience,” and so I was like, “Let’s do the gay thing, no one else seems to want to do it. And so you know, maybe there’s something there.” And so I actually applied for a job at Equality California, a super junior like database role, and I got the job on the spot. It was actually one of my last interviews where I was like, ‘If I don’t get this job, I’m going to Peru and teaching surfing,’ and you know like could actually go to grad school you’re like, I’m overqualified for every job and no one has enough money to pay me. So luckily I was able to get that job on the spot, I spent almost five years there during the No On Prop 8 campaign, and it was really just- I mean it was the perfect role for me because we grew, I mean we went from a $5 million organization to $15 during the No On Prop 8 campaign, and I was able to really, you know, take on things that I’d wanted to learn. So I really fell in love with some of the online stuff, some of the more tech geeky things. I ended up building a wedding registry, no one else wanted to do it, everyone was of course too busy during the campaign. And I thought, you know there’s a great opportunity here to raise money for people that are getting married. There was this window when we had one marriage in the courts, and so gay people were getting married like crazy, especially considering we might lose it at the ballot box. And so instead what a better way to raise money than asking your friends and family to help keep your marriage legal, instead of a toaster oven, right from like Williams Sonoma, they could do something really special. And so we ended up raising $2 million through that campaign, and it was sort of my baby, and it was one of those things that just- it kind of was the beginning of my like online passion and sort of taught myself you know some front end stuff, and how to connect things, and how to build a minimum viable product even though it was really gross on the back end, just certain things that I never would have- would have taken me much longer to learn because of a campaign type of environment. But I also learned some other things which is you know, especially for gay women in the fundraising culture, you know they just didn’t give as much money, and when they did it took a lot more effort. And a lot of that stuff you start, you know that’s where the grad school theoretical stuff came in handy because obviously women don’t make as much as men, we have different issues around money and culture and all of those things. And so plus you know working at a nonprofit you sort of look at your path and I made the sort of guess that it would take me two paycuts and about five to eight years give or take to make six figures; and that would be if I really, really did well and I picked some of the right organizations to move to. Maybe even ten years. And so that didn’t seem like the right path, because I ended up being pretty senior by the time I left Equality California. And so you know I thought there were two choices; one, start my own business or go work for the for-profit side and hopefully be able to exercise more economic power through being a donor. And so I applied at a couple for-profit jobs and just decided that it wasn’t for me, and instead decided to start my own business. And that’s, you know, really doing some of the stuff that I did for Equality California, and that’s really where the entrepreneurship started. And I decided to, of course being a do-gooder, I couldn’t just focus on entrepreneurship so I ended up starting- or joining a board of an organization called StartOut which focuses on LGBT people who are doing entrepreneurship. And so through that process, it was really interesting, I learned a lot about many different things, but that’s where I sort of became part of a larger tech world and realized how you know you go to gay events in general, and it’s mostly men. But you go to gay events in the tech world and it’s like 95% men. And that’s where really I started to realize that there was a larger opportunity for lesbians, gay women, queer women, in the tech area specifically. And so we started having these happy hours and things kind of took off from there. That’s really exciting, that is such good stuff. So as you said it’s just kind of a little bit of a zig-zagging road, but it all kind of makes sense when you put it all together as one story. So I always like to- and this is such a great start, and I have plenty of questions to ask once we get moving. But I usually like to throw my guests off and just before we get into some of the more serious questions and the deeper questions, just ask you to share some sort of fun fact about yourself that few people know or would expect from you. I always joke and say like sometimes when I get overwhelmed with things I really just want to quit everything and have a blog dedicated- of course this is so like stereotypical lesbian, to my two dachshund dogs. Socks and Magoo, they’re super popular on Vine. I love- I seriously, I make way too many videos of them. I did notice they’re part of your About Us page. Yeah, they’re pretty amazing. You know we work from home, and we travel a lot, and so you know they’re like obviously a big part of our family and our day-to-day life. But I’m a fourth generation dachshund family member. So dachshunds are like- it’s one of the few things that I have in common with my family. But like my parents had them, my grandparents, my great-grandparents, it’s on the German side of the family. Wow. That is funny. So if they venture off of Vine and onto a blog we know how that started. Exactly, exactly and I start selling like dog toys or something. Who knows? The path does zig-zag, who knows. I mean it’s never- it’s never like an ‘ah-ha’ moment, it’s more sort of like a gut feeling at certain points that sort of like changed my trajectory. I mean I really you know starting the own business was more of like, ‘Oh we started to do a friend’s website,’ and I was like, “Oh my God, we can offer these three other things.” And I mean even where the business is now three years later to where we started, you know at first I was doing any project I could get my hands on. And now we’ve cultivated these sort of price points, you know and since we focus on a lot of social good organizations, budget is an issue, and your option is hire a freelancer or hire a big agency, a creative agency to do things like design and branding. And so now we’ve developed these between $800 and $5,000 a month you can have dedicated like professional design, development, and database support at like a budget that fits your need. Which allows people to scale and grow in a way that’s actually less risk than hiring a staff person, especially for a nonprofit; I mean hiring a fulltime person is a big risk. And so- and a lot of times you just don’t need that level of support. And I had no idea that we’d end up there when we first started. And obviously like things like, you know, women making $0.49 to the dollar in tech, in Silicon Valley specifically, these are things like women, equality, like gay rights, I mean these are just obviously like continual passions and it’s hard when you see a need or a part of the community that’s not being served. For me personally it’s almost like I have to try it, and else I can’t stop thinking about it. And it’s okay if it fails, but I need to get it out of my system and move on in life. That makes sense and based on what you just said even, you must have some sort of deep commitment and something that motivates you to keep doing this every day. Because I’m sure there’s those days where you just feel like you’re running into a wall and you’re just going to start your dog blog. So what inspires you and just keeps you motivated every day? I mean you know I’m- I always tell my partner, I feel like it’s kind of like back to that athlete mentality. You know I think I have a deep belief that you should be doing things that are challenging. I love to grow, I mean when I’m like stagnant or doing the same thing all the time, like I’m just not a happy human being. So for me it’s always like I just- I learn the most when I’m doing things that are hard. And so that’s like personally fulfilling. I think that you know I grew up in a really conservative Christian family, and so the gay thing has just always been like a personal- you know seeing just I mean even how the country is changed in the last six years since Prop 8. Just even that, you know, has been so amazing but there’s obviously so much work to do. And you know being a young woman who like I said, like wanted to be President when she was ten, you know I don’t know if you’ve seen the film, ‘Miss Representation,” but it sort of talks about how women you know really early on there’s like a lot of young girls who want to be President, and that like slowly drops off. And it’s because of culture and sort of the way we view women, and power, and what’s valuable for women versus what’s valuable for men. I mean men don’t have to be good-looking, they can be rich and successful, right? I mean look at like music or film; you can be an ugly guy and get the girl, and for women it’s like we have to be smart, beautiful, and once we get a little too old, it’s like we’ve lost a lot of our power and especially in politics you can really see that. And so I think that for me it’s about focusing on it, and it’s hard, and change is slow, but I think that I’m a big believer in just doing as much as you can. It’s not everyone’s responsibility all the time, but we should do what we’re capable of if we have the opportunity. Absolutely, that makes perfect sense. I feel like I’m really similar in what you were just describing where I feel like once I just kind of hit that plateau where it’s just kind of stagnant, or I’ve brought an organization to the level that it doesn’t really need me to function anymore, it’s like well I don’t want to just kind of sit here and do nothing. Like to me that’s not growing, and I guess maybe it is kind of an athletic mentality where it’s just kind of like, you know pushing yourself to the limit, so I totally get that. Wow, I would love to look at information about that, that is absolutely fascinating. And that really when you think about it, it does make sense. Totally, I was like there’s a Ted Talk for you. Oh yeah, totally. That’s awesome. So let me ask you do you have any type of advice that’s just been one of those guiding principles for you that just somebody gave you along the road that’s just one of those best nuggets of wisdom that you carry? Yeah, it’s interesting. I mean as you get to be a little bit older and on your career, right I mean things like public speaking become more important, and you’re like, “What are my little nuggets of stories and important factoids,” and things like that. For me, and I’m still developing this story line, but- and I don’t think anyone told me this, and I really don’t know how it became to be so important. But risk taking has just been such a consistent theme in my life, and you know I really- as far as like gender stuff is really trying to figure out like what made me such a risk taker? You know it’s not from my upbringing, like my parents are not big risk takers, no one else in my family is. I have this story that I’m trying to get out around sort of like, you know, when’s the first time you took a risk? And I think I was like five or six and I went to my mom and I said, “I’m going to take my brother up this hill, like up this mountain.” And she was like, “Yeah, yeah, whatever.” I was like five, right? I mean it’s so little. And she, a few hours later she’s like looking around for her kids and she’s like, “Where are they?” And she’s like, “No way.” So she goes outside and she literally looks like- you know it’s probably like two miles away, and she sees like two little figures like climbing up this- I mean it wasn’t a mountain, but I mean for me being five it was totally a mountain. Like climbing up this hill where there’s a water tower on top, at our home in San Diego at the time. And my brother’s like three and a half. I mean I had no business like doing that at all. And I think back to that story and it’s just like what A) made me so brave to think that I could just go two miles, take my brother and like climb this hill? B) Like why did I even want to do that? And see like what makes me versus someone else be more interested in taking risks. But the more I sort of look at who’s successful in life, there seems to be a theme. I mean you just- big risk, big reward. And if you don’t take the risk, A) you don’t learn anything- I mean every time I’ve taken a risk, even I mean I’ve made some awful decisions; those have been the moments where I’ve learned the most. And you know are definitely connected to how I’ve gotten certain places. So I feel like there’s something there, and what I tell people at our events when I talk, is you know it’s really important to not only take risks on yourself, but it’s really important to take risks on other women. If you have any power- and you usually have more power and influence than you think you do, you know hire a woman, hire a person of color, take a chance on them. There will always be more white men in positions of power until there’s not. And so, and if we sort of say years of experience is the guiding principle to determine success which I think is incorrect, I think there’s more factors but that’s the most standard one we use today. I think we have to, especially women, have to take it upon ourselves to really take some risks on other people. Do you find in general women tend to take less risks than men, just in your personal experience and maybe you know data or studies that you’ve seen? They don’t need to worry. Women-focused nonprofits can get super talented, I mean like Yale law school grads to work for pennies at these like women-focused nonprofits, because you know what? They want to wake up every day and do something they care about. But those are the things- like people will only pay so much as they have to. If you can get talented people for less, you will. I mean it’s just one of those things, and women are willing to work for less to do something they care about, and it’s one of the reasons why I think women don’t make as much as men, because that’s just- it’s that bigger, you know story. In the US at least, I mean this is very US-specific. And I think that a lot of women have some sort of preconceived notion that if you want to be doing something that you love, that you wouldn’t be making a lot of money doing it. And I think that that’s something that needs to kind of be flipped on its head, just in a- I guess in a broad perspective. That even you know, men and women both have some sort of assumption that you have to be miserable in your job. And I feel like- and I hear that a lot from a lot of different people, and it’s like no. If you’re not happy where you are, just because you’re dreaming of something that would be better and make you happier and more fulfilled, doesn’t mean that you should be making less while you’re doing it. And I think that it tends to air on the side of more women than men in that scenario. Totally. Yeah, no and it’s- you see it, I mean even at Equality California, I mean men sort of end up making more because you know they probably started off at a higher salary, they might have negotiated higher. And they just don’t- they won’t- it’s not the social part isn’t as important, this is generally again. But so they start out a little bit more in the beginning and then over fifteen years of their career, you know it’s ended up being a huge gap for women. And so you really do have to negotiate and especially nonprofits, they’re always looking to save money and so it’s one of those things like most people- like there’s a market value and especially since we do a lot of services for nonprofits, you know and they’re always looking for discounts, and pro bono work, and I tell them especially as a staff person, you know you’re seeking pro bono support, and I know this is hard to like understand, but free stuff ends up directly impacting how much your salary could be. If people- if people could get free stuff at like financial services at Goldman Sachs, like do you think it would end up impacting how much the traders make? Absolutely. Like it’s all- the value is all connected. So if we constantly get free stuff, give free stuff, then our whole value, our whole market is going down. And right now in the social good world, I think there’s a huge problem because people you know think that the social good stuff will end up- you know it will make them happier because at least they’re doing something they care about. But what ends up happening is there’s no incentive, there’s no bonus, there’s no upward mobility in terms of pay increase, and the social good at the end of the day isn’t enough of a fulfillment, and unless you have decision making power- so especially if like you know it’s a lot of bureaucracy, and you don’t even get power in your job and you’re not making a lot of money, you end up feeling disempowered, you check out, and you’re not very effective at the end of the day. Absolutely. You’re not effective, you’re not productive, your priorities are elsewhere, and it’s just at that point you’re just collecting a paycheck. And that whole reason for why you started doing what you did in the first place is somewhat out the window at that point. Exactly, which is you know, cool to see there’s a whole like you know trend toward social entrepreneurship and it’s still really early, and I think revenue models for social good are- not everyone can have them. There will always need to be C3 organizations, especially in health and human services. But you know it’s actually one of the reasons that I want to make Lesbians Who Tech a social enterprise. I want it to be sustainable, there’s like more growth, you know? It’s part of that whole like cultural problem. Yeah, absolutely. And we’re definitely going to get into the Lesbians Who Tech in just a couple of minutes. I want to switch gears a little bit and just talk about marketing for a moment. And on that note we are going to take a small break to hear from the sponsors of this podcast, www.MentalCompass.com. As always I like to thank Mike and Maria Keiser of www.MentalCompass.com for their support of this podcast. So if you have a moment to head over to their site or listen to their podcast, I highly encourage you to do so. And with that being said, let’s get back to the interview with Leanne. So for somebody who’s listening to this, and they are interested in trying to reach the LGBT community in an authentic way, an appropriate way, from your perspective what type of advice would you give them that you think would help make them more successful? Like are you talking about just like a nonprofit or just a general LGBT business? Or are you talking about other companies that want to reach LGBT people? It could be absolutely any of those scenarios. Moreso I’m thinking from small business owners, medium sized businesses, or even corporations who are really looking to market to the LGBT community, understanding that there is a market there, and it makes sense for them to focus on, but they just want to do it in a really genuine way. Totally. I mean I think it’s- you know it’s obviously different if you’re- you know take Lesbians Who Tech for example, as we’re trying to get sponsors for the summit, it’s been really interesting having conversations. And whether the recruiter point person is gay or not, obviously makes a difference in some of these conversations. But one of the things that you know we tell them, is sort of like can our straight men come? Can our straight women come? You know can the gay men come? And we’re like, “Absolutely,” we say, “and the people who love them.” But also you know if I was a lesbian attending this conference and I met a straight man from let’s say Oracle, and he said, “You know I’m here because I really want to learn more about the queer experience. The queer woman, the gay woman experience. I think it’s really valuable and I obviously want to make sure that they feel welcome at my company,” or any sort of these sound bites work; they’re just there to learn and be a part of it. I think for me, that’s like gold. I mean I might hug someone who said that to me. Seriously because it’s just- you know you have to- you have to go and listen, and you have to- we’re trying really hard to get straight allies there, and gay men, and it’s been really challenging. I mean it’s hard- it’s really hard to get gay men at our events, I mean I’ll be totally honest about that part of it. I think we’ve actually had more traction with straight men than any other groups besides lesbian obviously. You know this is just my personal experience, but I’m really trying to put effort into that. So if you’re listening, we definitely want everyone to attend. But yeah I think trying to reach the community you have to go where they are, and listen, and then figure out how to develop the right messaging and the right thing that fits them. We got an inquiry from GM because they have these eco-friendly cars and they can’t find lesbians. So you know it’s sort of one of those things like when have we been able to work with them, they really want gay women, you know are a good demographic for their eco-friendly cars which totally makes sense. And they have been really great like to work with on this. And so partly because they’re just- they’re listening and we’re trying to work out something that makes sense. I think we’re going to do like speed mentoring in the cars, you know so it’s a win-win for us. Yeah and just you know being- I think being creative and open to- because our summit isn’t maybe the most like- it’s not at a hotel, it’s not very standard, it’s a little bit of a creative experience. But they’ve been really open to, you know, figuring out something that works for both of us. That’s really interesting. So essentially your message is basically to just go and listen, and you and I know that the LGBT community is not monolithic, and that there’s many, many facets of LGBT. So I think that your summit itself is actually a really good example of that. That you know, using GM as that example of they’re smart because they understand that women and gay women specifically are a good market for them. So they listened, and now they sought out an organization and an event that aligns perfectly with that. So that’s really smart it seems. It’s good advice, I like it. And I feel like out of the- I think this is probably close to my 40th interview on this podcast, and I have not had just that be the piece of advice, so that’s really awesome. Interesting. What are the other things- what do most people say? I get a lot to not treat the community as one large group, that one comes up quite frequently. I often hear people talk about how in your marketing efforts specifically, that you want to make sure that you’re including having a good- like an inclusion-based type of focus where you’re not just excluding LGBT entirely, or have two separate marketing campaigns kind of going down separate tracks, and you’re trying to just reach the ‘gays’ and I just put that in air quotes. You know in just like LGBT publications and that kind of stuff, but be more inclusive and more mainstream with what you’re doing. That seems to come up a lot too. Yeah it’s- there’s definitely a lot of stuff, and around this since you are indeed the one heading up Lesbians Who Tech, what in- other than the obvious, how have you been able to leverage your status as an LGBT person in a business setting? That’s interesting. I think about that, a lot of people sort of ask me you know, do you get a lot of clients from Lesbians Who Tech. And the truth is no, I haven’t gotten one client from Lesbians Who Tech yet. But I mean the other part of that is I haven’t really tried either, so it’s not like that’s a marketing strategy. For me obviously, you know the more people- people also ask like, “How do you get new clients?” And I say, “The number one thing is make new friends.” Old friends are usually like the worst potential clients because they might see you as something else, and they are just your friend, and so they’re like, “I don’t really get what you’re doing.” Where a new person that you meet instantly sees you as an expert, and sort of that’s the like lens in which they see you. Like through your company, which was really a big lesson for me early on because you spend all this time like reaching out to people who trusted you- and not that some of those people can’t be helpful, of course. But you know introductions from old friends to new friends ended up being much more successful from a new client perspective. So that was interesting. But yeah it’s been- I don’t know, I don’t know that there’s been any example that I can think of as far as like leveraging me being gay in a business setting; but that’s something I haven’t actually focused on either. Yeah, I think that occasionally you have- and I think everything, almost every single thing that you’re doing is actually a result of just kind of leveraging your status as an LGBT person, whether it’s- whether it was conscious or not I think. Yeah, she’s a friend of mine. Oh awesome, of course I feel like it’s the two degrees of lesbian separation. I know. The lesbian mafia. Right? But with her interview it was really interesting because when she kind of set out on her path, being a lesbian wasn’t really anything that was on her radar as something that she was going to leverage. And now looking at what she’s doing it’s like that’s almost exactly what she’s doing. She’s totally just leveraging it for the benefit of everybody else. So- which is similar to what you’re up to which is awesome. Yeah it’s just important to be out. Like, you know I mean that’s where- I mean I tell people all the time like especially because I mean with sexual orientation, it’s not something that’s obvious. And I mean I spend hours, if not like hundreds of hours probably total stalking people online to find different gay women, you know trying to obviously get outside my circle and find other diversity outside of just, you know, lesbians in San Francisco. Or lesbians of a certain class or race. And it’s- you know it’s interesting. It’s definitely I’ve had some funny, you know just like tweets back and forth with people like, “Hey, do you know someone who might be gay?” I mean it’s just- so it’s definitely part of just my life now. And it really, I think you just summed it up really well, is that it’s important to be out. You know if you’re in any type of role where you have any type of influence, whether it’s a really small circle of influence, or if it’s something really significant, I think it’s so important for- I think younger LGBT people to be able to- especially younger women, younger lesbian women to be able to just see the fact that there are positive role models out there. And if we’re all hiding in the closet, that’s not going to help anybody. Alright so a little tangent, but why don’t we just kind of dig in a little bit more around the summit? So if you want to explain- I think right now people may have a little bit of an idea of what Lesbians Who Tech, what you guys are doing. But if you can just maybe share a little bit more about the organization, and then where it’s happening, how people can get involved, and all that fun stuff. Totally.  So Lesbians Who Tech is a community of queer women and around tech. We make a really conscious effort to say lesbians and queer women. It’s been- I mean I could talk an hour just about that. I mean people have very strong feelings about both words, either being inclusive side, and then obviously you know, a lot of lesbians don’t have very positive feelings with the term queer. So I think it’s really important, I don’t think there’s one word or one phrase that can win. So we’ve made a conscious effort to use both. But I’m open to discussing that conversation further if people ever want to email me. Because I do have a lot of interesting thoughts around that. I would love for you to guest post actually on that. Because I feel like that’s something that I’ve gotten asked as well, and I’ve never actually written about it. That would be pretty fun. Yeah I actually have like some template emails that I’ve saved from different like conversations with people. Because I mean I just love- like I’m a debater, you know. I mean I just love to have intense conversations period. Add a glass of wine and I’m really happy in a hot tub, even happier. But so it’s one of those things that yeah, I mean I’ve just- I’ve been doing the gay stuff for I mean like, God ten years now. And I mean even the National Center for Lesbian Rights, I’m pretty sure they talk about this probably every year at their board meeting. But it is a really interesting thing. So we have four main goals; one is obviously just to connect each other, amazing things can happen when we simply know one another, and it’s not always obvious who the other gay people are in the room. Number two is to be more visible to the world. Wouldn’t it be amazing to have a lesbian version of Mark Zuckerberg or Bill Gates, and obviously just you know, more women being out? Especially in other industries like other than in like music or you know, we just have Ellen and Melissa Etheridge, and I mean some politicians now which is great, but I think that more business role models would be super helpful for young people. Number three we want to increase the number of women in technology and leadership positions, and we want to make sure that queer women are not only a part of the conversation, but a part of the solution. You know the gender in tech conversation can be pretty heteronormative, so we just want to make sure that you know our experience is a part of it since it tends to be different. And number four we want to connect our community to people or organizations who are doing great work for us. Of course like following the trend of women wanting to do social good, we want to make sure that you know, the Lesbians Who Tech community is also connected to groups that are actively working to increase diversity in tech and LGBTQ rights, and women’s rights, we think that’s really important. And so those are the four things. We started out you know, doing happy hours, it was one of those things I wasn’t really sure how many gay women there were in our community, or in tech at least. Like I said, you know years of going to fundraisers and unless it was NCLR, an event like specifically for gay women, it would be anywhere from 75% to 90% men. And so it’s always kind of that question. Like how do we get more women involved? How do we get more women to come? And unless you do a women’s event, you just didn’t see the women. And so one of the things that I realized is that you really- if you are going to have a general gay, like an LGBT focused on both men and women, then you need to have a woman leader, and you need to have a large representation of women on your board, a woman founder. You know I noticed they start out being one, another group called Out in Tech. They have like four male founders. And Out in Tech just brought on a woman. But you know it’s one of those things you can’t have four or five gay male founders, and then ask where are the women. You know it just- you can’t- to anyone who’s ever thinking about starting an LGBT group, please have close to 50% women representation. Like you will regret it later, you will never recover. I mean I just think it’s really hard at the beginning of a group, it’s almost impossible to like- to start like if you’re starting at such a place of deficit you will probably never recover in terms of gender equality. So just think about that before you put four or five male founders, it’s just- it’s not going to be good for you later on. And it seems like- and this is from my experience here in Connecticut at least, because I was the executive director of the LGBT Chamber of Commerce, and the founder and president was also a woman. And our chamber had such a really- and it still does, has such a healthy mix of men and women, and it’s probably more on the dominant side of women who are involved and lesbians who are involved since it is the LGBT chamber. And I think it has a direct correlation to having two leaders at the top that were female. And I think that an organization can bounce back from having a really heavy female focus, to coming back to that center area of having a 50/50, versus the opposite direction of what you were just talking about, which is you really- it’s really hard to recover once it’s out there that it’s so male based. You’re really kind of driving away all of the female- the possible female attendees. Totally, and it’s one of the things, you know I have a lot of conversations with gay men about this, and you know it’s just one of those things that- and not all of them feel this way, but I think it’s hard that they just don’t see it as much. But I’m like, “You have to understand. Like women are looking for this. People of color are looking for this. When they step into a room it’s almost one of the first things they notice, how many people of color are there? And how many women?” Like that’s- and if you’re trans or you know bisexual, maybe those people are thinking the same things, I don’t have as much experience with those conversations. But I know for sure that women and people of color, when they go to these events, they’re looking to see how many of themselves are represented. And if you go on a website and it’s four male founders, you’re probably not even going to give them a chance because you’ve probably tried before, and that’s the other thing. I ask most gay men, I say, “Okay if your fried stepped into an LGBT event, and it was 80% women, even 70% women, would you stay the whole time? Would you come back if you did stay?” And I think most of the time the answer is no, I mean I just- if they answered really honestly. And I think that’s what women have been doing for years and years, this is not a problem that has happened once or twice, this is something that happens every time they go to a gay event. And gay men can’t relate to that experience. You know which is why I’d love them to come to Lesbians Who Tech, because I think it’s really important for them to understand that experience. And if a gay man said that to me, I would not only hug him, but I don’t know, I would give him a prize if he came to the summit and said, “You know I know that there’s barely any gay women at most of the events I go to, I just kind of wanted to understand like the flip side of that.” Seriously, I would cry maybe. That is hilarious, there’s the call to action, everybody. Exactly. Because I think it’s really important, and it’s a struggle in our larger community. It’s interesting I think most- not every, but I have had a lot of women in tech are like, “Well why can’t Lesbians Who Tech kind of just be a part of like the larger women tech community?” And then the same thing is true for the LGBT tech stuff. Like why can’t lesbians just be a part of the larger LGBT tech stuff? And it’s like, I totally get it, and let’s partner and let’s work together, but our experience is different. I mean especially on the gay side, I mean women in tech make $0.49 to the man’s dollar; that is a different experience than gay men. That is totally different and we have different goals, and let’s work together, but you guys have different goals. Like there’s some overlap for sure, but this is a different experience, and it’s a different problem. And so yeah, and so we have these happy hours and basically you know, they got to be crazy from a time perspective. They’re mostly free but we ended up- we’re in like twelve different cities now, we did a couple international cities, I travelled this summer and I was like, “Let’s have some happy hours in London and Berlin,” and they were great. But my partner was like, “Okay, like this has turned into a full time job. So let’s figure out-” Plus I mean it’s time to provide more value beyond just happy hours and meeting people anyways, just as far as like doing this for over a year now. That’s like the next step in the lifecycle. Exactly. And so you know most people have fundraising galas, and I want to do something a little different. I didn’t want to sort of do that sort of- I don’t want to be- we don’t want to be like a traditional nonprofit, you know? I think there’s an opportunity to provide value in the tech community, and also allow the tech community to give back to something that’s very specific to them, and provides them a lot of value. So this isn’t- you know I don’t think we should be getting money from like big gay foundations. This is about really connecting with the larger tech community and having a win-win both ways, and getting some honestly new money into the space. So we decided to have a summit, we thought it’d be a great way for people to connect, have some amazing stories, obviously have some new leaders be out and on video. We’re going to do a halfathon over the weekend with a social good focus, and we’re still kind of, I mean all the- I’m working on content, finalizing the agenda now, but we have almost 500 people, we’ve got some great sponsors that are starting to sign on. And yeah, it’s- and it’s in San Francisco at The Castro Theatre which is obviously, you know just historic of itself. That is pretty awesome, and what are the dates of it? It’s February 28th, there’s like a welcome happy hour on Thursday the 27th. And then March 1st and 2nd are the halfathon, and we’re actually like doing some satellite events like a golf outing, and a bike ride, and a hike. And brunch for people who are trying to make it a whole like weekend experience now that we’ve got some good interest. That is awesome. So if somebody is listening to this, and they’re thinking, ‘Oh my God, I have to go to it,’ how would they find it? It’s www.LesbiansWhoTech.org and then up top it says ‘Summit’ so you should be able to find it pretty easily if you just Google Lesbians Who Tech Summit, that works too. Perfect. Well thank you so much for taking time today to chat with us, and why don’t you tell everyone else how they can find you, whether it’s Twitter, email, other websites, in case they have any other questions. Yeah my email is Leanne@startsomewhere.com. Or you can find me at Twitter, @LePitts. Fabulous, thank you so much and I know you and I will certainly be staying in touch. Alrighty, so I hope that you really enjoyed that interview with Leanne. She’s got so much information to share, and she also had some great insights on where the lesbians are, which if you have read my blog in the past, or you follow what I’m doing, you know that I’m somewhat on a mission to figure out how to market to and find more lesbian clients for the businesses and the customers who are coming to me. So I am on a mission to find where the lesbians are; seemingly Leanne has quite a stronghold on a lot of them in the tech industry. So if you want more information about that, just make sure that you head over to her website, check out the Lesbians Who Tech Summit, and of course send her a tweet, let her know how you found her, and yeah. That’s about all I got, so I hope you enjoyed the interview, and I as always encourage you to leave a comment, leave a review on iTunes, do whatever it is that you can to help others find this podcast because at the end of the day, the more listeners and the more readers that I get, the better it is for everybody because honestly my main goal is to help you be more effective in your communications and marketing outreach to the LGBT community. So I appreciate you spending the time with me today and listening to this podcast, and I hope that you tune back in for episode 29 in just a couple of weeks. Thanks so much, if you’re in a cold climate, I hope you stay warm. If you are in a warm climate, I’m jealous and I’m coming your way. Have a great one, I’ll talk to you soon. 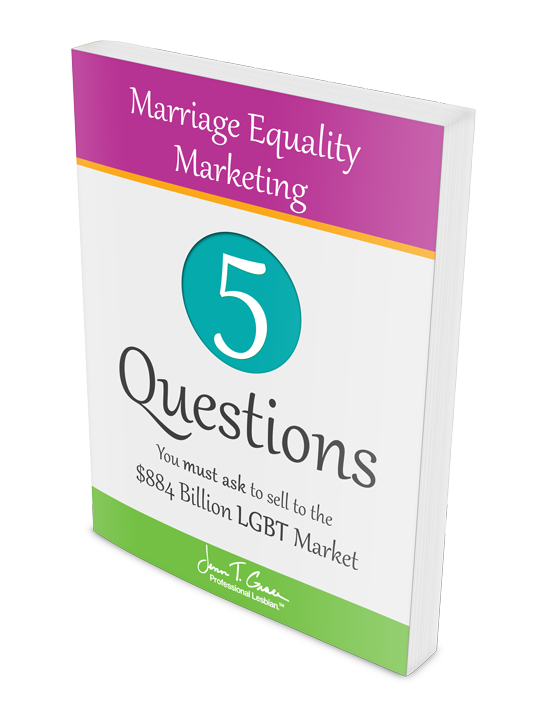 Want to sell to the LGBT community but feel overwhelmed? Take these 5 quick action steps to get you on your way to success! There are 5 things you need to know to sell to the gay community. Learn them all in detail in this free eBook. Instantly increase your confidence and sales by entering your email address below! 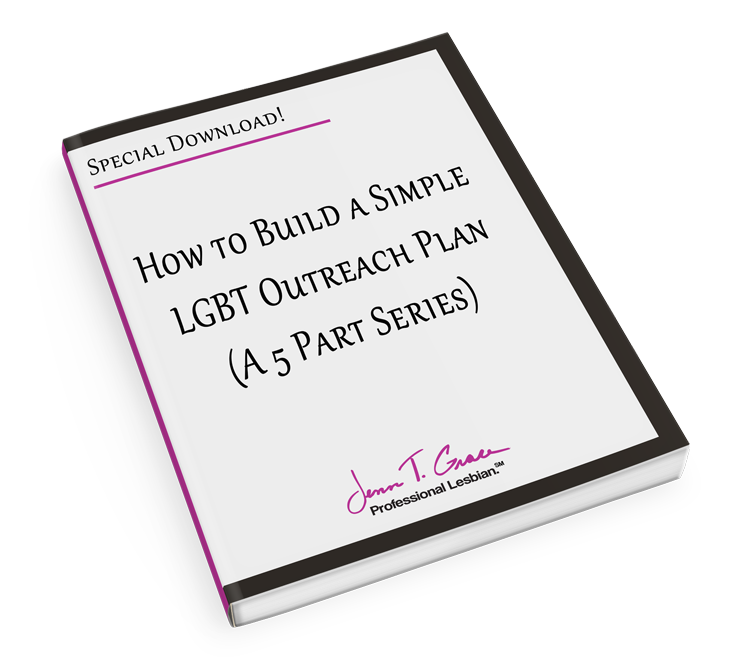 Jenn T. Grace is a business strategist, speaker and author specializing in the LGBTQ market. Her work guides corporate and non-profit clients as they navigate the space where doing business and managing the workplace intersects with LGBTQ issues. She has written multiple Amazon Best Selling books and is a nationally recognized speaker and podcaster. Passionate about helping people share their stories of adversity, Jenn is the Founder of the Publish Your Purpose Press and Author's Academy Publish Your Purpose Press. She holds a M.S. in Integrated Marketing Communications from Golden Gate University and a B.S. in Communications from Salem State University. She lives in Hartford, Connecticut with her family. 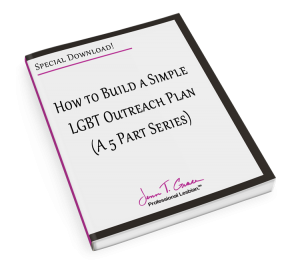 Why today is the day to start your LGBT marketing outreach! Instantly get a leg up on the competition by entering your email address below! Why does the LGBT community seemingly hate its allies? 3 reasons you should never say homosexual. ever.